With the demand for renewable energy projects growing, Hoosier Energy is bringing the benefits of utility-scale solar energy to our community. 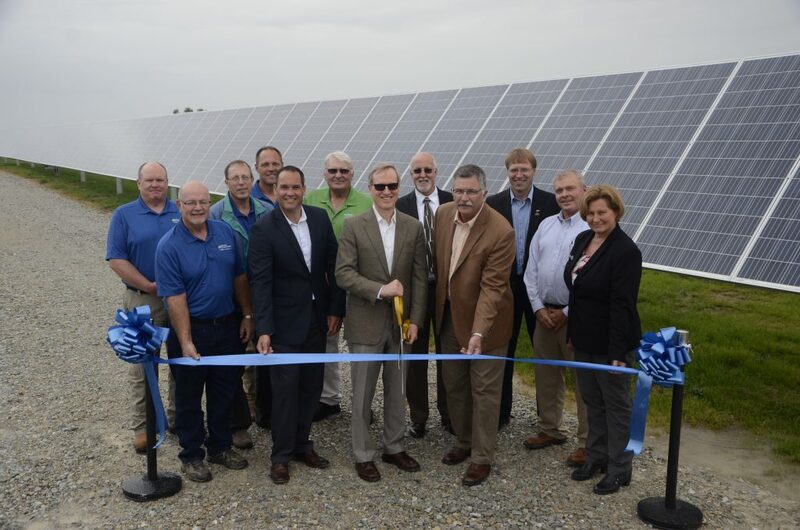 On a gloomy fall day, directors and representatives from Decatur County REMC, Southeastern Indiana REMC, Hoosier Energy and local officials dedicated a new, cooperative-owned, solar array on Thursday, Oct. 5. Thousands of solar panels near Columbus are now supplying energy to the grid for the benefit of cooperative consumers throughout southern Indiana. The 3,900-panel array is capable of generating one megawatt of power. Decatur County REMC and Southeastern Indiana REMC worked alongside Hoosier Energy, their power supplier, to identify a prime location for the array. “As a cooperative, our focus is always local,” said Brett Abplanalp, CEO of Decatur County REMC. “Thanks to this project, we are in a better position to learn together how to best tap into the power of the sun to bring renewable energy to our communities,” added Keith Mathews, General Manager of Southeastern Indiana REMC. 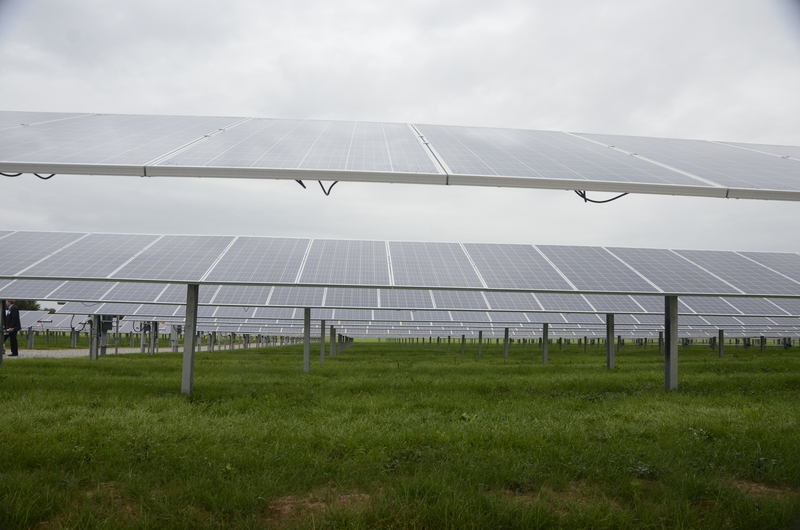 The array is the final array to be dedicated in Hoosier Energy’s 10-site solar program. The solar initiative is part an “all-of-the-above” power supply strategy to diversify the cooperative’s generation portfolio and further the cooperative commitment of affordability, reliability and community. Collectively, the solar sites represent an opportunity for Hoosier Energy to obtain information on how the latest solar technology can provide low-cost electricity for member consumers. Once collected, this information will help Hoosier Energy and its member systems to learn more on how this variable energy resource integrates with the grid and how solar power might offset the need for other, more costly energy resources during periods of high demand. Directors from Decatur County REMC and Southeastern Indiana REMC participated in the ribbon cutting ceremony at the Center solar array Oct. 5, 2017. Decatur County REMC is located in Greensburg, Indiana, is a member-owned electric cooperative serving meters in Decatur, Ripley, Jennings, Franklin, Rush and Bartholomew counties. Southeastern Indiana Rural Electric Membership Corporation (REMC), headquartered in Osgood, Indiana, is a member-owned corporation that has supplied electric power to member-owners since its incorporation on April 29, 1939. Southeastern Indiana REMC serves portions of Dearborn, Franklin, Jefferson, Jennings, Ohio, Ripley, and Switzerland counties in southeast Indiana. Hoosier Energy is a generation and transmission cooperative (G&T) with headquarters in Bloomington, Indiana. The G&T provides electric power and services to 18 electric distribution cooperatives in central and southern Indiana and southeastern Illinois. Hoosier Energy operates the coal-fired Merom Generating Station, three natural gas power plants, several renewable energy facilities and a 1,700-mile transmission network. For more information, visit www.hoosierenergy.com.